This book succeeds by matching some of the world's greatest cheeses with unexpected, seasonally inspired flavors and textures and presents a composed cheese plate as a fun, modern, and accessible option for delicious entertaining. Master delicious, sophisticated entertaining with acclaimed chef-fromager Tia Keenan’s foolproof pairings and quick recipes for elegant cheese plates and inspired accompaniments. 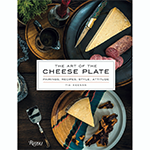 A perfect gift for any host or cheese lover, The Art of the Cheese Plate offers clear directions and expert tips for perfect cheese plates and creative condiments. Composed plates showcase great European and American cheeses and bespoke accompaniments for every occasion. Full provenance information and tasting notes enable the reader to find or substitute the cheeses according to availability, season, and taste. Recipes are quick and simple, utilizing a few key techniques. Delight in each unexpected combination, including Bûcheron with Tandoori Cashews, L’Amuse Gouda Signature with Coffee-Hazelnut Crisps, Marcelli Formaggi Ricotta Pepperoncini with Basil and Preserved Lemon Pesto, and Jasper Hill Creamery Winnimere with Mosto Cotto Glazed Bacon. Tia Keenan is a New York–based chef-fromager and writer. She created the cheese program for Danny Meyer’s The Modern and pairings for Murray’s Cheese. Her work has been featured in Food & Wine, The New Yorker, and on The Food Network.